When I began losing weight, one of my first assignments was to clear my cupboards of all the foods I shouldn’t eat. 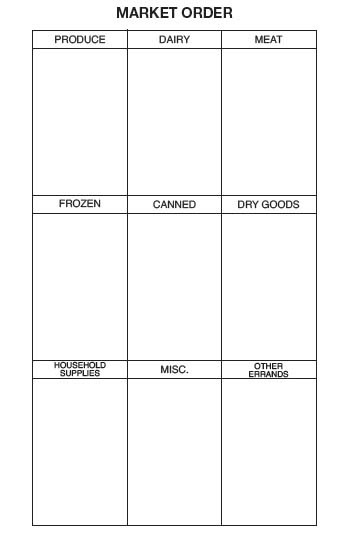 Next was to purchase the right kinds of foods, bring them home, and organize them. Plan your menu for the week, and then make a market order. Under each heading I list everything I need. I check the newspaper or internet for sales on produce and other grocery items. This will save money as well as calories. At the store, shop the fresh produce aisle, then meat, dairy, cereal, bread, and so on. You may do it in a different order. It doesn’t matter, as long as you stay away from the areas where you may be tempted to buy unhealthy foods. Try to buy the most nutrient-dense foods with the least amount of added sodium, and check labels to make sure they fall into your prescribed program. Wherever possible, avoid processed foods. I watch for sales on lean meat and buy in quantity. At home I cut it into individual portions (4 ounces per serving raw and 3 ounces cooked) and freeze, thawing in the refrigerator a day or two before using it. Whole-wheat bread, which I also buy in quantity and on sale, freezes well. I save about 50 percent on both my meats and breads. I usually pass on foods without labels, except meat or produce, as the sugar, fat, and salt content are unknown. One of my favorite activities is visiting farmers’ markets during the summer and fall. The only way I could have fresher food is to have grown it in my own garden. I enjoy meeting the farmers who have nurtured the crops and asking them questions about their produce. Each time I go, I bring home new techniques for preparing and storing my purchases. If you don’t have farmers’ markets in your area, look for roadside produce stands or locally grown produce in your favorite supermarket. If you will take care about what you buy, it will benefit your health and your weight in so many ways. You will find many more healthful ideas on how to take care of yourself in my healthy living book: Tipping the Scales in Your Favor. Permanent weight loss is not a diet; it is a lifestyle change. There is no one "magic bullet." Instead, it's a matter of consistently incorporating a number of steps that include exercise, eating right and accountability. It's like leading a symphony: You've got to have all the instruments playing at the same time or you don't get the results. 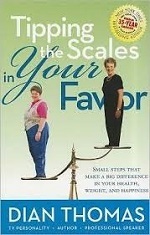 In Dian's new book, Tipping the Scales in Your Favor, she shares step-by-step what she did to lose more than 125 lbs. and keep up an active lifestyle. The pages of the book come alive with practical tips, healthy recipes, more than 175 beautiful color illustrations, and her refreshing and honest story of the journey. For more information, go to www.DianThomas.com, and check out the book on the right side of the page.